Today we made a videogame die, with the number on each face represented by some classic game. In the picture you see 6 Minecraft creepers, 2 Space Invaders, and 3 Pac-Man dots; the other three number faces are 1 companion cube from Portal, 4 Super Mario Brothers mushrooms, and the 5 Tetris pieces. Settings: Today's build was made with the Afinia H-Series we have on loan at the house this month. With .2 mm and default settings at "normal" it took just under an hour to print this die. Technical notes: This die was made in Minecraft with a little help from WorldEdit and then exported to .stl with Mineways. The paint is nail polish applied after printing, guided by the raised designs in the model. Nail polish seems to dissolve PLA a bit, but the Afinia can print with ABS, which is nail-polish-paintable. 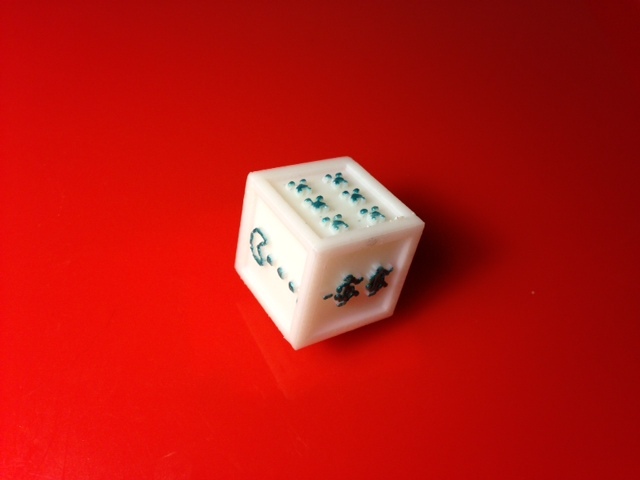 Finally, if you are part of the grammar police force and want to complain that the title of this post should reference a "die" instead of "dice" then you can just go print two of them to solve the problem. Stuff you might want to change: This print is kind of large for a die, about 25 mm on a side, so you might want it smaller. But the symbols on each side are about as small as they could get; a redesign in Minecraft might be worth it. Note you can export from Tinkercad to Minecraft and do just that if you like!